Uniformly cut the bananas. Mix maida, rice powder, sugar, sesame seeds, turmeric powder, soda powder and required amount of water in a bowl. 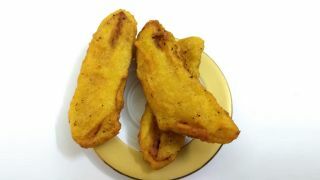 Dip the banana pieces in batter and fry it in hot oil. Fry both the sides.